New Finely-Honed Finish: EverEdge scalers are sharp...EverEdge 2.0 scalers are even sharper. Using an enhanced finishing process, Hu-Friedy's professional artisans are creating edges that are scientifically measured to be over 72% sharper than the next closest competitor. Less force means easier, more comfortable scaling for the clinician. 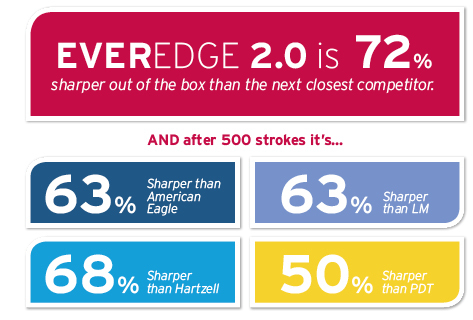 Stays Sharper Even Longer: EverEdge 2.0 uses an optimized heat control process in order to maintain the hard, sharp edge. This heat control, plus several manufacturing intricacies in Hu-Friedy's proprietary process, provide the durability needed for effective procedures and continued use. Revolutionary Testing System: Hu-Friedy has invested in a custom blade evaluation system to ensure clinicians are receiving the sharpest possible instruments. Blades from every batch of EverEdge 2.0 are tested right off the factory line to confirm that sharpness value remains in our target range, averaging 5 newtons of force required to cut the test material.